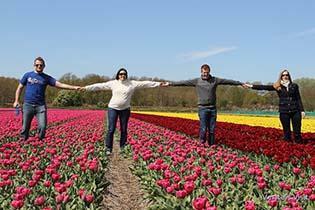 Follow the main canal from Haarlem to Leiden and it takes you right to the best flower fields of the bulb flower region. 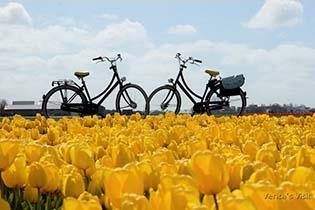 The Haarlem Tulip Fields Bike Tour is all about enjoying the Dutch landscape in the most relaxed way. Price: from € 65,- p.p. On an e-bike we go through the many hyacinth, daffodil and tulip fields, along the sea and through the dunes where we might spot a deer. We stop for a drink in one of the many quaint flower villages and have as many breaks as you want to take pictures of the canals, windmills and the millions of blooming spring flowers.